Hussam Matti knelt to the ground, grabbed two fistfuls of brown-gray sand and poured it over his head. The grains mixed with the sweat on his brow as he stood up, smiled and threw up his arms. But for Matti, despite the dangers, it was nothing short of a homecoming. “In these two years I died. The 32 years I’ve lived so far — you can forget about them. Today I’m born,” he said, as he and his comrades, all members of a Christian militia known as the Nineveh Plains Force, lashed two pieces of timber to make a cross. They carried it to the top of Mar Shmony, a church on the town’s eastern flank. 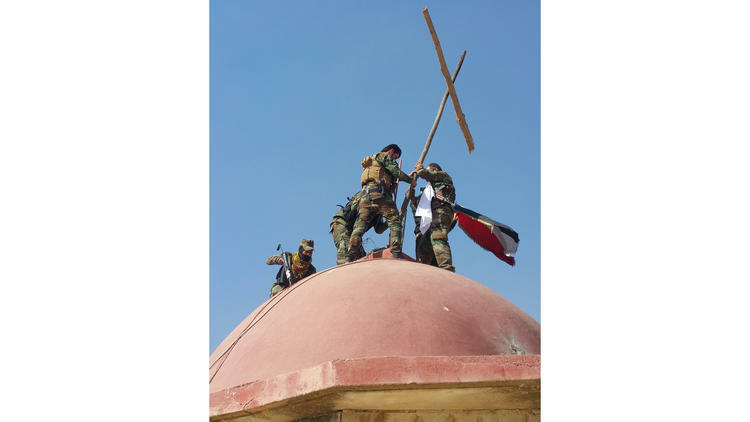 There, ringed by counterterrorism service members who urged them to watch for sniper fire, they hoisted the cross over the church’s dome and adorned it with an Iraqi flag. One man, with a touch of ceremony, placed a nativity scene set he had fished out from the wreckage of the church at the cross’ base. 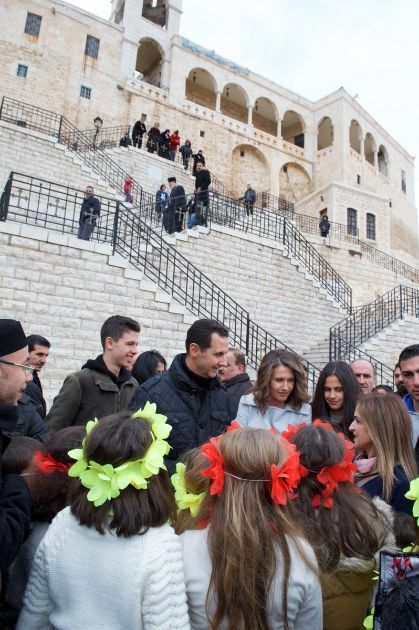 A multi-credal nationalism emerges across the Middle East, in opposition to Wahabbist hegemony funded by the Saudi and Qatari royals. At the end the Vicar paused, beamed at us, and prepared to give us our Christmas blessing, at which point the organist launched into the cheerful tunes of dismissal. I commiserated with her [ouch. and we were doing so well] over a drink later. “I was only going to say Merry Christmas” she lamented. I assured her that her intentions had been sensed by the congregation, but that our services moved in a mysterious way. It's all about Who lives Where. And Christianity depends on living, breathing, worshiping Christians. And when it's gone, it's gone.